One of the main reasons why the Annapurna Circuit Trek is so world-renown is the close intimacy the hikers have with the local people. 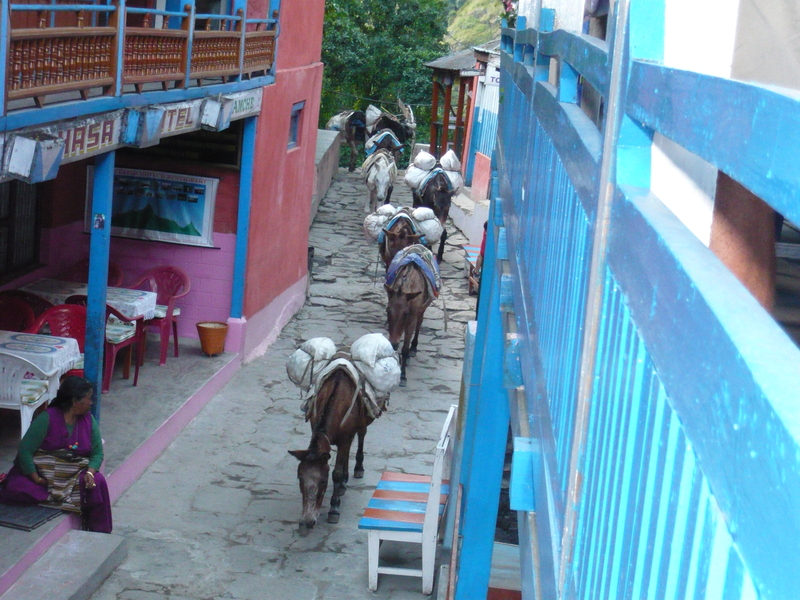 The trekking route circles around the magnificent Annapurna Conservation Area and passes directly through picturesque villages representing an immense variety of cultures. The trek starts off in the jungle and climbs higher and higher elevation, and the landscape and communities began to change. The jungle disappears and the pine trees emerge. Then at the highest point of the trek, Thorong-Phedi (almost 18,000 feet), it is stark and barren. There are remnants of Tibet (which isn’t far) and the landscape is dreamy, brown and wild. The trail continually changes along the way and it is utterly fascinating. Throughout the trek, the Buddhist influence surrounds you and you feel Buddhism’s mystical powers every time you enter into a village. There is always a giant prayer wheel strategically placed in the middle of the trail and trekkers are reminded kindly to walk on the left side for good luck. 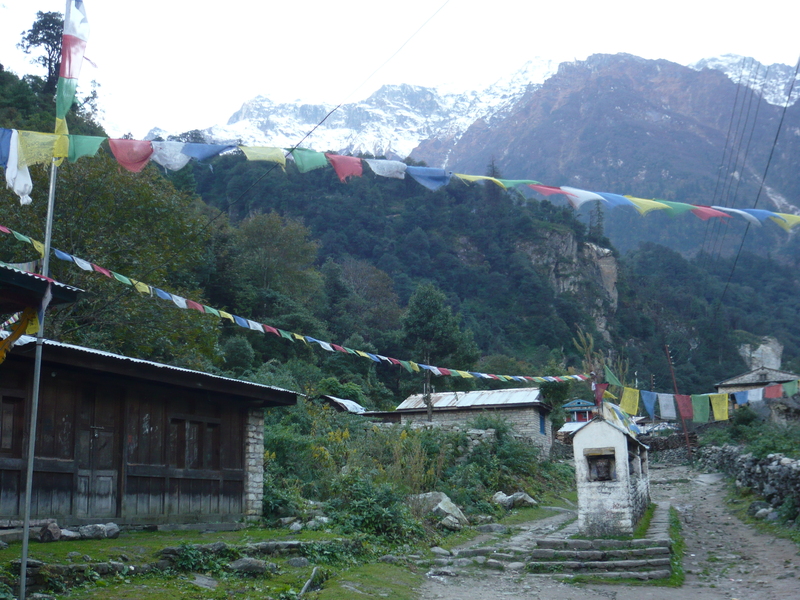 Colorful Buddhist prayer flags soar gracefully in the sky assuring you that you are in truly in Nepal. You can also find the common scent of burning juniper, the low rumble of the Buddhist drum, and the beautiful, decorated stupas (bell-shaped Buddhist shrines) at the entrance of each village. What makes this trek so unbelievably unique is the fact that you are completely immersed in the culture, not just a witness. 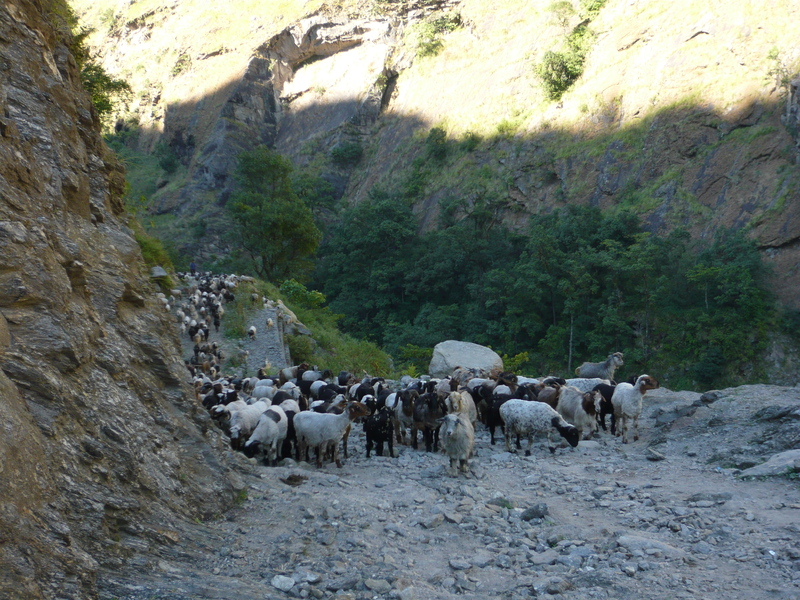 Trekkers use the exact same routes as the villagers thus can experience firsthand how rural Nepali people live. 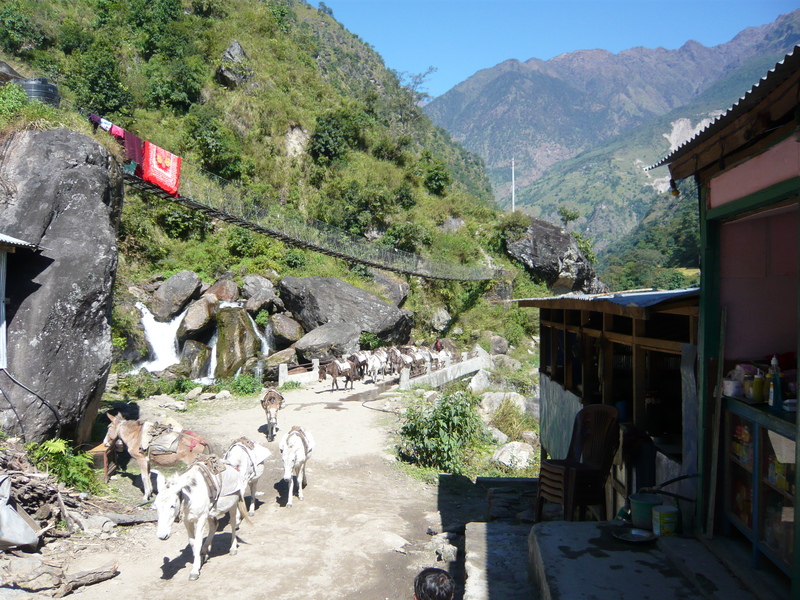 It is not uncommon to spend an entire day hiking with the locals, as they go about their business herding sheep and goats, transporting supplies village to village using mule trains, and carrying a cage full of chickens on their back village to village until the cage is empty. Each village welcomes you with a friendly namaste and a varying difference of cuisine. 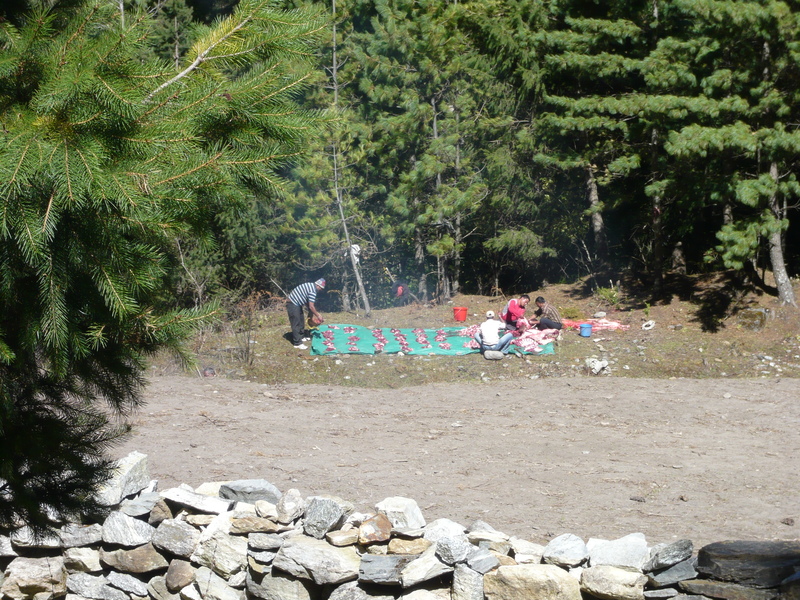 The food was surprisingly good, especially given the modest cooking methods (there are no ovens…only fire-burning stoves). Villages have their own variations of the “national food” Dal Bhat (which is a curried lentil soup poured over rice) as well as Tibetan entrees such as momos (chicken dumplings) and sometimes teahouses offered more western food such as pasta and pizza (yet is didn’t taste anything like what we are used to). Village life is very traditional and basic. There are no luxuries. Electricity arrived only a few years ago and is spotty in its use. It is common for the electricity to go out every day for a few hours because there simply is not enough electricity to go around in Nepal. 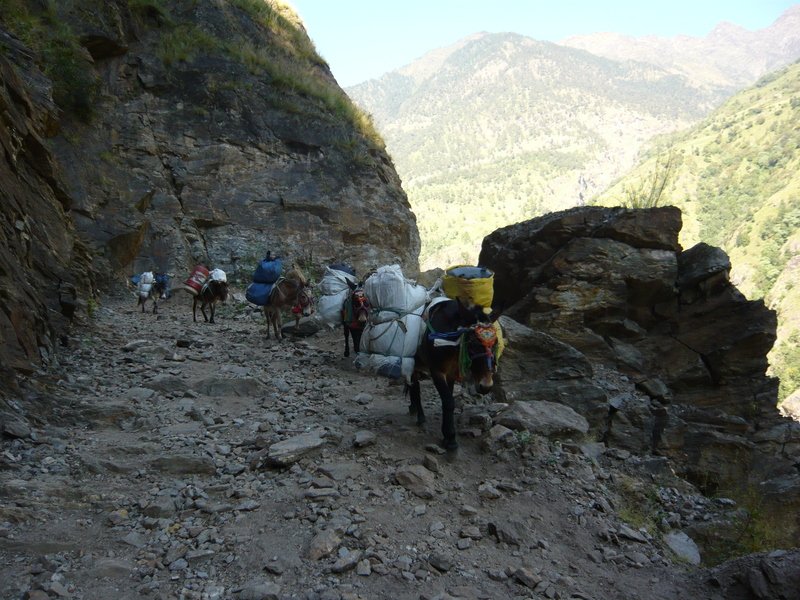 There are no roads, only the rocky, mountainous trails and villagers live a very hard, simple life. 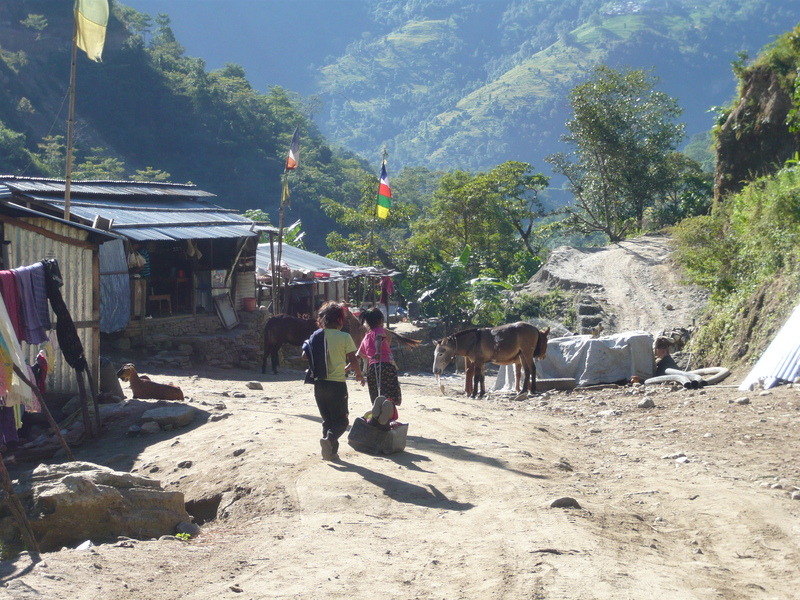 Over 80% of the population of Nepal is rural and of course the hard life and lack of jobs is not for all. Like most developing countries, there is a mass exodus to the cities in hopes for jobs and education, which is devastating to the preservation of traditional Nepali cultures and languages (there are over 100 different languages in Nepal!). After a few days of trekking, I felt far away from the world I knew at home and completely immersed in the beauty, magic and culture of Nepal. So what if there were no western toilets or hot water to take a shower? I was in Nepal and loving it! 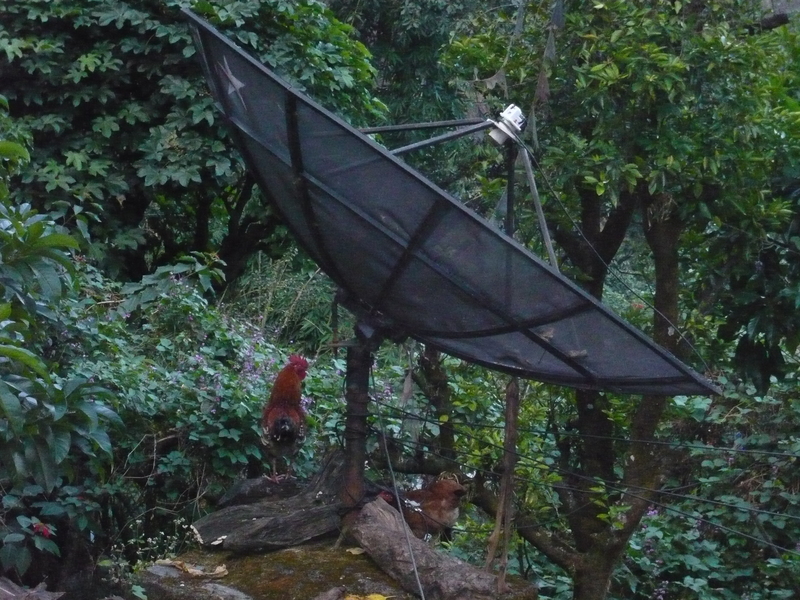 The sharp contrast between the past and present: A rooster atop one of the only satelite dishes around.